Kawachi duck specialty restaurant Tabuchi is located along a main road close to Kitano, a popular tourist area in Kobe, a few minutes' walk from Sannomiya Station. 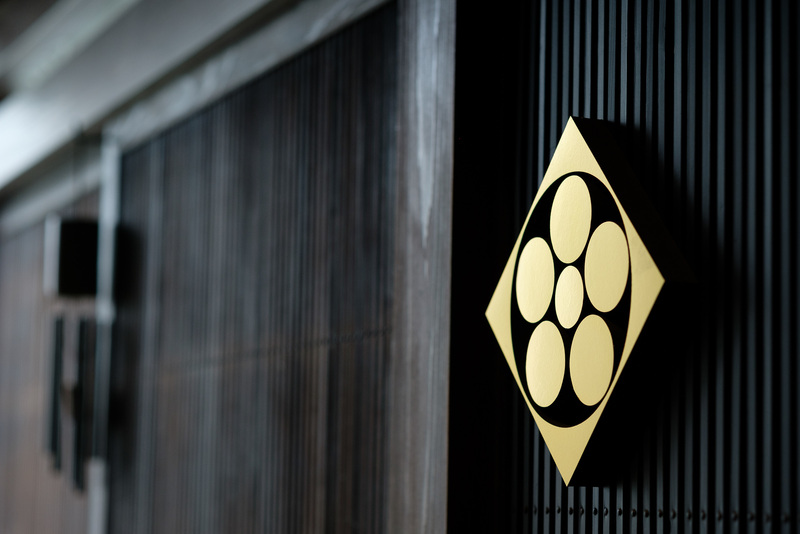 The specialty restaurant earned one Michelin star in the special Hyogo edition of the Michelin Guide, creating a new category of Duck Cuisine in the Guide. The menu items on the board are hot pots. Their duck meat is the very definition of "fresh," coming from Tsumura Honten, a company that has specialized in raising a cross between mallards and domestic ducks for 150 years in Kawachi, Osaka, since the beginning of the Meiji era. Their strict policy is to purchase duck processed that morning, and only enough to use on the same day; if they cannot acquire it, they do not cook that day. 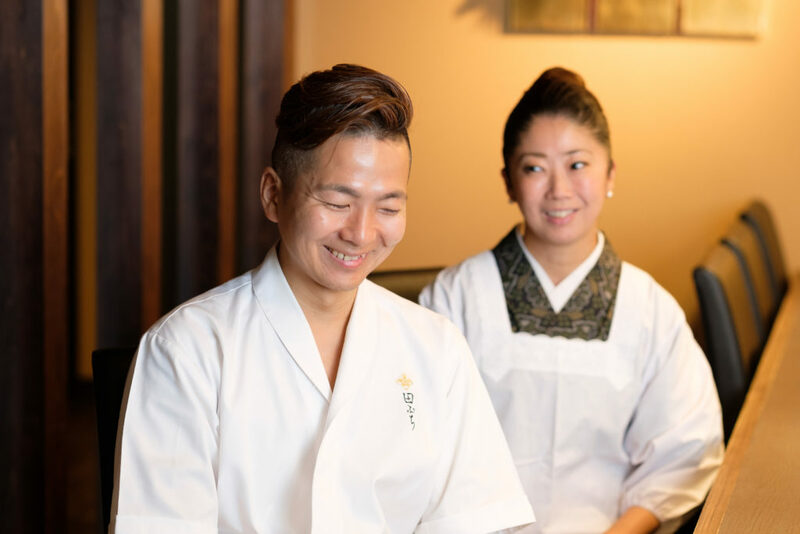 This well-known restaurant is frequented not only by local Kobe foodies, but also by many visitors, although head chef Kota Tabuchi has a bit of an unusual background. 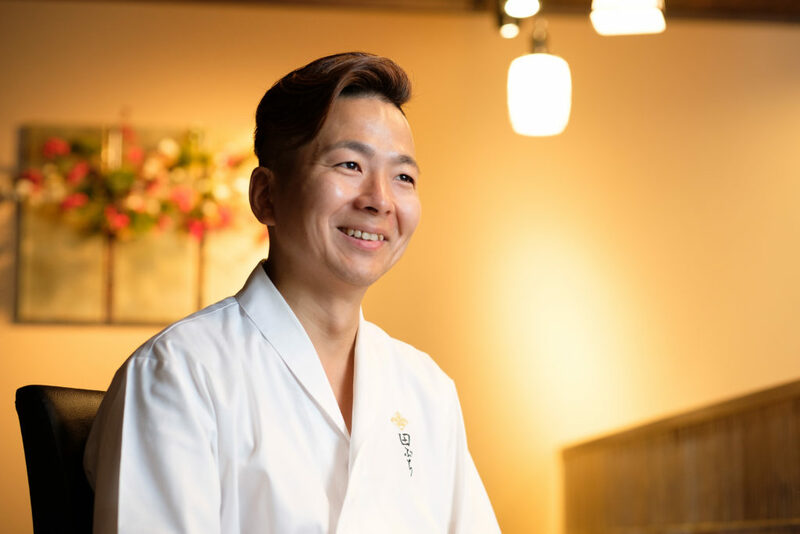 After spending 15 years opening restaurants for a company that developed bars and creative cooking establishments mainly in Kobe, he studied duck cookery on his own, and finally opened up a restaurant specializing in Kawachi duck. 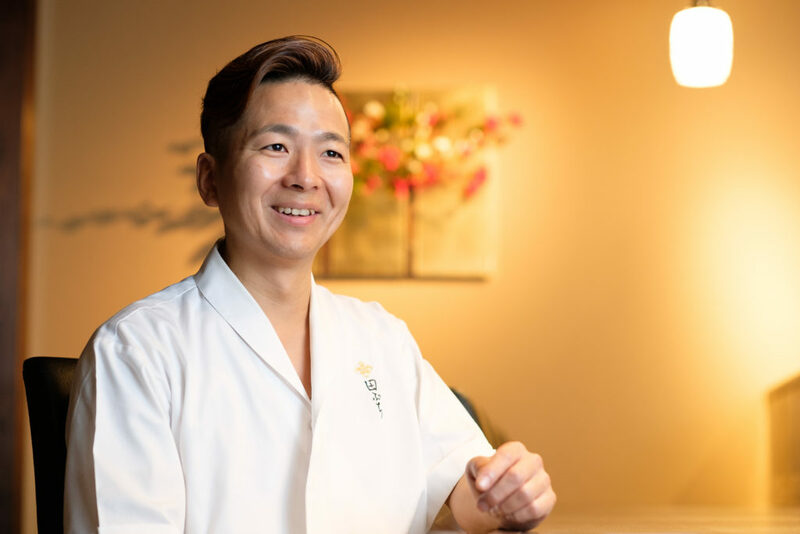 "I'm not sure if my comments here will be useful to anyone, since I have no formal culinary training," Mr. Tabuchi said modestly, but his background is exactly what I wanted to focus on during the interview. 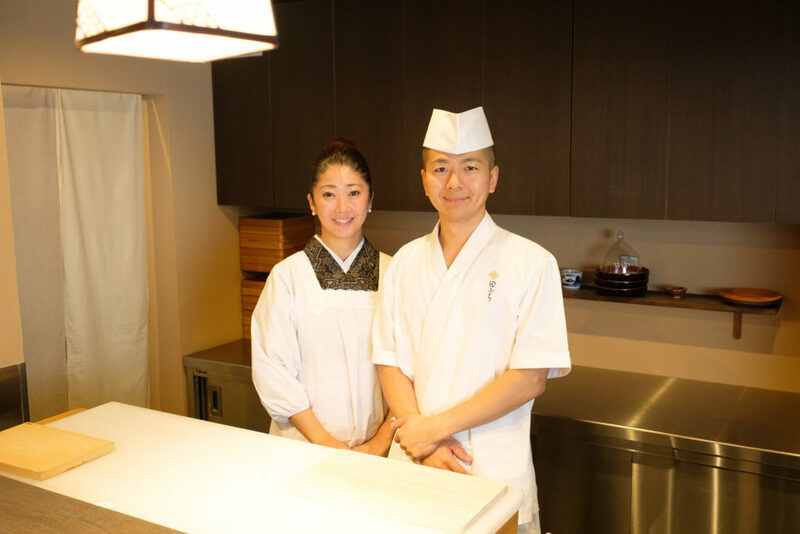 We also had the hostess of the restaurant, who works closely with Mr. Tabuchi, sit in and give her thoughts on cooking and the process of opening the duck specialty restaurant. As a mainstay of this famous restaurant, her comments are also worth noting. Point1. Getting involved in the food and beverage industry as a bar manager. Point2. Learning cooking through self-study. Ending up at the ultimate duck, Kawachi duck. Point3. The desire to pursue a flavor loved by guests across generations. This is the first time Foodion has invited the restaurant’s hostess to sit in and offer comments as well. First, Mr. Tabuchi, please tell us what made you aspire to becoming a chef. I was first involved with cooking when I had a part-time job as a high school student. Around that time I was interested in working at restaurants where adults could enjoy food while drinking alcohol, and I got a part-time job at a bar. My everyday routine was to go home after school, change, and head straight to work. My family ran a small workshop, and my father said that he wanted to leave it to me, but I loved working in restaurants, and I was feeling that perhaps I didn’t want to inherit the family business. However, I also could not ignore my father’s wishes, so after I graduated I started working at my father’s company to help out. About two years later, the Kobe earthquake happened, and my father’s workshop was affected and we lost everything, including our house and the company. Losing our family business to the disaster was a difficult time, but we had to work in order to survive. I did part-time work in Osaka and Kobe for a little while after that, but one day in Sannomiya I happened to run into the bar owner who had helped me during my high school days. We talked about various things, and he ended up helping me out again so that I became an employee at the bar chain he ran. That was just when I turned 20. That is what made me move forward into the food and beverage industry. What kind of work did you do at that company? From the start they had me in the kitchen cooking. Cooking itself was a lot of fun. The company was involved in running bars, sushi restaurants, yakitori restaurants, etc., so I also helped the company president with developing new restaurants and creating menus; I was busy with work all day, every day. At the time, unlike now, young people were drinking sake, so we had a lot of customers. It was after the earthquake and the end of the bubble economy, but the food and beverage industry was thriving despite the economic downturn. That company was also good at hiring and training employees, so there were many part-time student workers who ended up there full-time. I enjoyed working in the food industry, but I always planned to quit when I was around 30. I thought I would train the younger generation to take over and leave the work to them, but then I became a store manager, and would also have to hand off the work of developing restaurants, and I couldn’t get out of it. My wife was working there part time then. I was an art student studying to be a designer at the time. I was going to school and working part-time at the same bar as my husband. After graduating from university, I started working in Tokyo as a graphic designer, but even though we were far apart, we stayed friends the whole time. You were trained at a company that opened many restaurants, weren’t you? Well, I don’t know if it was training, since I was a restaurant manager. Unlike most chefs, I have almost no experience in culinary training. It was mostly self-study, and if I had any training at all, it was getting a little instruction in the cuisine of a particular restaurant so that I was better able to expand their business or offer menu suggestions. Because I worked on expanding various types of restaurants, I helped out with French cuisine, and was taught a little bit about handling meat. In busy restaurants, I would sometimes help out on the spot, and have to manage somehow even if I didn’t really understand the details of the cooking specialty. It was hard sometimes, but I enjoyed being taught about cooking in and of itself. During that busy time, I had to take a break from the company to have surgery for appendicitis. Until I was hospitalized, I thought that the restaurant and the company couldn’t run without me, but when I suddenly wasn’t there, they both ran after all. Realizing that they could get along without me was what led me to quitting. So then did you begin to prepare to open an independent restaurant? Well, actually… I’m a musician, and I have been playing in bands since my student days and making music with friends from my time as a manager. Around the time I turned 30, our band got a contract with a recording company and made our debut. I never thought I would have that kind of opportunity. I had been working ever since I started at my father’s company at age 18, and had never been able to play around and immerse myself in something I loved, so I might have had some resentment over that. I didn’t want to have regrets, and I decided to go along with it. Though that’s not to say that my music career took off straight away. I was also helping out at my former company in my spare time. In the end, my priority was on the band, so I took about two months off to make the recording and kept both lines of work going. But the music world is unforgiving. I tried hard for five years, but never made any money. I started thinking that there was never going to be any money in music. From age 30 to 35 I learned the most about cooking, even though I was in a band. Why did you quit music? I quit because we got married. I knew that I couldn’t marry my wife in my situation at the time, so I made the decision to leave the music world and make a more dependable living. What did you think at the time, Mrs. Tabuchi? I had seen him work at a restaurant so I wasn’t worried at all. I thought it would be fine if we both worked hard at a restaurant or something. I had supported him for a long time as a friend, but while I was in Tokyo we started dating, and when we decided to get married I returned to Kobe. My father was highly opposed to it though. (laughs) Since his daughter was marrying someone with no job and no money. But now my father really likes him. My husband is a good worker, and he takes pride in this restaurant. The chef is listening with a bit of a wry smile. What happened after that? Well, we looked around for something that only we could do. I liked grilling over charcoal, and soba. When you think of what goes well with both soba and charcoal grilling… it’s duck. That’s how we arrived at duck. After that, I learned through self-study. I acquired all kinds of domestic and imported duck meat, and after trying many types, I found that one clearly rose to a level above the others. That was Kawachi duck. There are various types of duck, but wild duck was not suitable because it cannot be reliably purchased all year round. After searching for a way to acquire fresh domestic duck, I found Tsumura Honten, which has been raising ducks in Kawachi, Osaka since the Meiji era. Once we decided that the two of us would open a restaurant, I was also preparing. In order to support the restaurant, I wanted to learn proper service, not just at the level of a part-time waiter, so I worked at a bistro owned by an acquaintance, and also learned about management and wine from the senior sommelier who owned the place. When I heard from my husband about opening a restaurant serving duck, and about Tsumura Honten, I was surprised that that kind of duck was available in the Kansai area, and had an idea. The area that we were considering for the shop was packed with other restaurants, and there were places of every type there. So I thought that serving duck cuisine would be a characteristic that would make us stand out. My husband wanted to go right away to talk with Tsumura Honten. So we visited. However, the fifth-generation head of Tsumura Honten is very particular, and my husband went many times only to be turned away; finally, he was able to gain their trust and purchase wholesale from them. That is quite particular for a company president. So since then, every day that our restaurant is open, we go pick up fresh duck meat directly from Tsumura Honten. I think that their ability to maintain consistent quality and freshness in their meat as a specialty store is due to the fact that they have this trust and commitment. 5 minutes on foot from JR "Sannomiya Station" · each line "Sannomiya station"